Bookvip - Not feeling the love !!!! Because the resort partner is paying the 70% discount on for these promotions, they set forth certain eligibility requirements for these vacation packages. 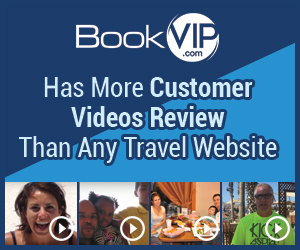 BookVIP was notified by the resort of a possible “Group Travel” issue when you and another party both contacted the resort and told them that your flight was delayed and you would not be able to check-in until the next day. The probability of the existence of a group travel issue was heightened when the resort discovered that the original flight of the “random person” you met at the airport had actually landed as-scheduled, with no delays reported. In an effort to clear up any confusion, BookVIP (as the booking company) contacted you as we were updated by the resort regarding the situation. The $199 fee you mention was quoted in response to your consideration of adding an extra night to your vacation package. All qualifications and restrictions, as well as any additional resort fees, taxes, and/or deposits which may be required by any particular resort are contained in the Terms and Conditions for each package. The Terms and Conditions are located at the bottom of every hotel/resort offering page on our website. The Terms and Conditions are reviewed with each guest during the sales call and must be greed to, and accepted by all guests before the reservation can be finalized and forwarded to the resort. Received an email to call asap and they ask if I was traveling in a group, how do you prove you are not ??? After 25 minutes on the phone they said ok we believe you. Ready to relax and have lunch at the hotel SW airlines provided for us we get a call from vip once again asking if we are traveling in a group and if we are they are canceling our reservation. After another 30 minutes on the phone they decided we were being truthful. Doesn't end there 2 more emails and 2 more phone calls I was over the top and not even sure I had accommodations when I got to Cabo. Good news is we got to Cabo and had a driver to pick us up and are now lounging poolside bad news is I spent an entire afternoon stressed out over proving I didn't know some random person. The funny moment in all of this is when we landed in Cabo and the driver was waiting for us we met the party that we were accused of traveling with and they were coming from east coast and missed their flight as well. They did not have the pleasure of all the harassing phone calls because every time they tried to reach vip the were hung up on. Bottom line, the property we are staying at informed us they have dropped this travel agency. My advise is to steer clear !!!! Product or Service Mentioned: Bookvip Flight Booking. I didn't like: Worst experience ever, Poor english, False advertisement. Review #796937 is a subjective opinion of User796937.